*Advertised Special Fares are based off a return trip to Madrid. Fares to other European cities may vary. London, Paris or *Europe: Madrid, Prague, Nice or Malta. Child and infant discounts may vary, please ask your specialist for further details. Companion fare rules require TWO passengers to travel together on all legs of the journey. Cancellation and changes fees apply. Please ask you specialist for more details. Qatar Airways is a 5-star international carrier and one of the fastest growing airlines in the world. 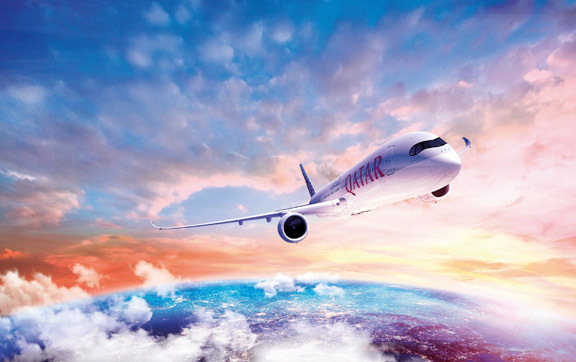 Based in the State of Qatar, the airline operates one of the youngest fleets in the world, flying to more than 100 worldwide destinations via its Doha-based hub. From Doha, Qatar Airways passengers can connect to popular cities across Europe, Middle East, Africa, Asia Pacific, North America & South America. Qatar also provides the fastest available travel time between London and Manchester, and has one of the largest networks in Europe. 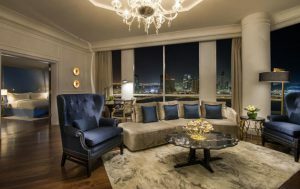 Occupying a prime seafront position on the Arabian Gulf, the Ritz Carlton Doha is a luxurious island resort in the exclusive West Bay Lagoon district of the city. Just 200 metres from Corniche Promenade and City Center Shopping Mall, this design hotel offers stylish rooms with satellite TV. It features an outdoor pool, spa centre and on-site restaurants. The Doha Golf Club boasts an 18 hole Championship Course, a 9 hole Academy Course as well as an enormous driving range and putting green, 8 artificial lakes, graceful landscaping and a beautiful clubhouse designed in old traditional Arabic style, which has been located at one of the highest points on the course giving it a magnificent prominence and makes it the perfect place to relax after a round of golf. The Racing & Equestrian Club’s magnificent grounds and luxurious Grandstand making it the location of choice for racing and with events held every Thursday and once a month on Wednesdays from October to May it’s an experience that can’t be missed. Enter your private sanctuary in First Class. Settle into your seat and enjoy unparalleled comfort and complete privacy. The spacious First Class is designed for you to feel well-rested and refreshed throughout your journey. You will be provided with ample stowage options and an ultra-comfortable fully lie-flat bed with Frette linen and a duvet. 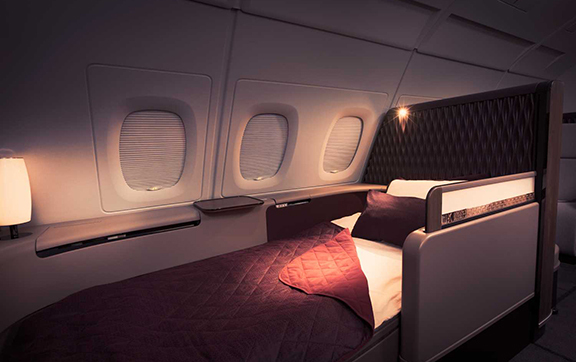 Qatar's new Business Class suites launched in June with the Doha to London route being the first to receive the new level of luxury. The First Class inspired suites have sliding 'privacy doors' and middle seats which convert into a double bed. 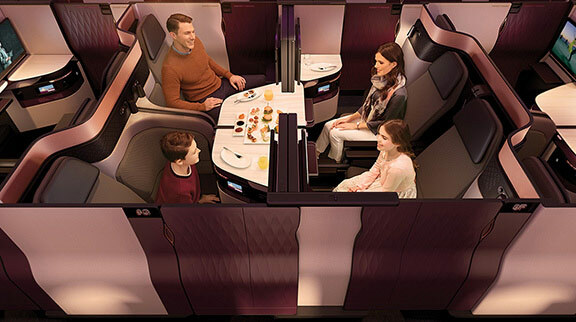 Qatar Airways redefines comfort onboard its award winning Business Class. Awarded "World's Leading Business Class" at the World's Travel Awards, their signature product features a 180 degree flat-bed seat, a foot rest with 8 in-seat massage settings, and in-seat power supply, on selected flights. Enjoy complimentary lounge access when you book Business Class with Qatar. In Al Safwa First Lounge at Hamad International Airport, Qatar's one and only priority is you – their distinguished guest. The focus is on perfecting every moment so your journey with us gets off to a relaxing start. Lounge access is for Qatar Airways First Class passengers only. Offering a luxurious experience rivalling any five-star boutique hotel, Qatar Airways Al Mourjan Business Lounge at Hamad International Airport promises to redefine the world standard in airport lounge experiences. The lounge access is for Qatar Airways and oneworld First Class and Business Class passengers only. More a boutique hotel or private club, the London Heathrow Premium Lounge for Qatar Airways and oneworld First and Business Class passengers is a venue where spending time is a pleasure. Indulge in world-class luxury draped with aesthetic designs at the Qatar Airways Premium Lounge at Dubai International Airport. With our superior facilities, Qatar Airways and oneworld First and Business Class customers can sit back, relax, and rejuvenate before their next journey. Baggage allowance will change depending on your desired routing and chosen fare, please ask your Travel Specialist for exact information regarding luggage allowances for your flights.